Location: In Piazza San Salvatore in Lauro, about 1 block north and about 7 blocks west from the north end of Piazza Navona. Metro: None, but bus 87 goes from the Colosseum to Via dei Fori Imperiali to the northern edge of Largo di Torre Argentina to east side of Piazza Navona, and back. The Fountain of the Lion is a really strange one. The piazza appeared to be a parking lot when I visited it. 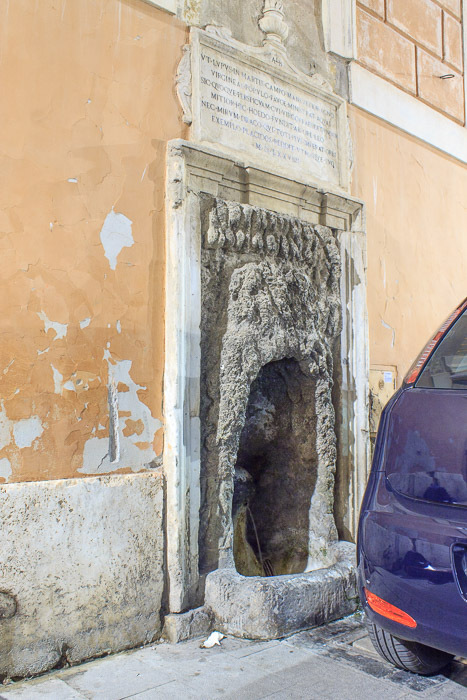 The fountain was moved to this location from somewhere else in Rome and is visible battered, consiting of a small marble door frame in the wall of a building, with a niche with a very rough surface inside it, and a vaguely defined figure of a lion inside, spewing water from its mouth. A car was parked in front of the fountain when I visited. See all Fountain of the Lion photos.